When we were young, every purchase we made was precluded by a loud ripping sound. Why? Because we had sweet velcro wallets, that’s why. From the time we realized that we could buy “whatever we wanted” with our own money, we never left the house without a wallet. Of course, the velcro wallets have long since been retired, but along with keys and a cell phone, the wallet is still on the “must have” list whenever we walk out the door. If you are still rocking the old school velcro, it is time to join the world of adults. 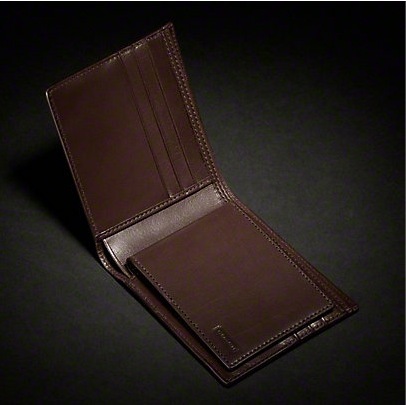 We recommend the Waterbuffalo Compact ID Wallet ($128) by Coach. Every once in a while, an unplanned adventure is just what the doctor ordered. Maybe it is an impromptu trip to the mountains for a day of hiking, or a trip to the coast for lunch at the place you have been thinking about since your last visit 2 years ago. Wherever your weekend adventures might take you, versatility is key when it comes to your clothes. 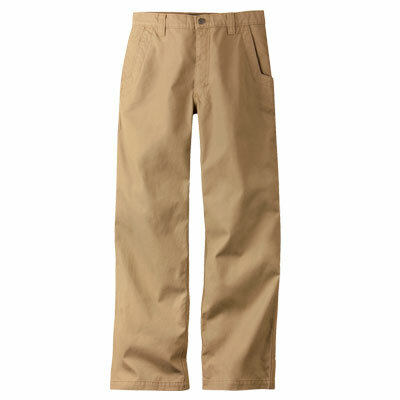 No matter what comes of your adventure the Original Mountain Pant ($72.95) by Mountain Khakis will never be a bad choice. 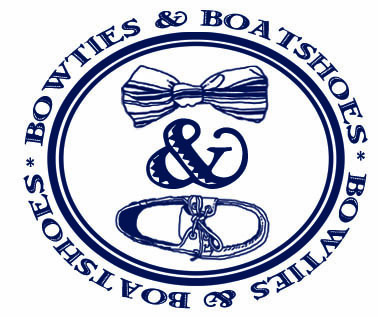 After watching 8+ inches of snow fall here in the Annapolis area, and subsequently shoveling that 8+ inches of snow, at Bows & Boats we are 100% ready for spring. Not only are we looking forward to golf, boating, and all of our other favorite warm weather activities, we are looking forward to breaking out the spring clothes. While the darker tones of winter and fall are great for now, there is just something about colorful pants or shorts that brings a smile to our faces. 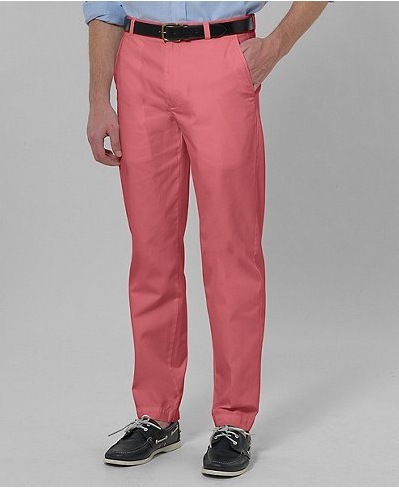 If you need to add some color to your spring wardrobe, pick up a pair (or two) of Lightweight Garment-Dyed Chinos ($95) by Brooks Brothers. The best part of running a blog is the interaction with you, the every day reader. From comments agreeing with our assessments, to those that take the completely opposite stance, it is always good to know that we are actually reaching people. One of the coolest things is hearing about the small, up and coming, brands out there that may not have popped up on our radar yet. 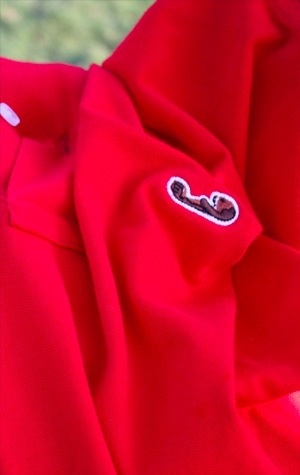 One such brand is The Otter Bay Company. Over the holidays, we started receiving a ton of messages asking us to review their shirts, and when we reached out to their founder, Will Pattiz, he was generous enough to send out a couple of Keystone Polos ($60) for us to review. At Bows & Boats, we’re big fans of polo shirts in general (as is anyone who is even somewhat preppy). At the same time, putting a new spin on the classic styling of a polo shirt is always appreciated. One of our favorite innovations is the “Polo Dress.” Although we’ve seen it from a number of brands over the years, we would recommend the Southern Marsh Polo Dress ($72) by Southern Marsh for the lady in your life. Oxford shirts are an absolute staple in our wardrobes. A great choice for the office, or a casual day out and about, every gentleman should have a number of oxfords at the ready at all times. While we like to change things up with different prints and patterns, sometimes a simple solid is the perfect choice to complete a classic look. 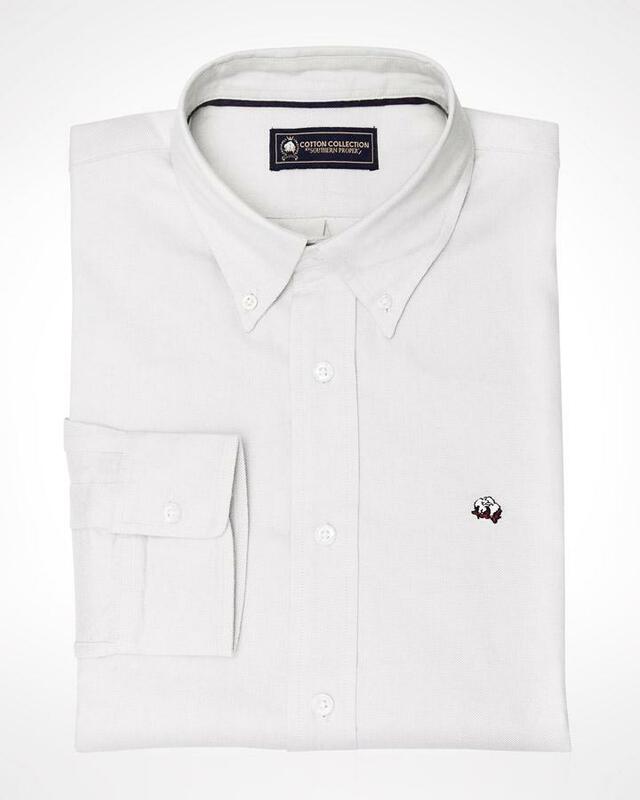 If you are in need of a few new solids, take a look at the The Cotton Collection Oxford Shirts ($75) by Southern Proper. We all have more polo shirts in our closet than we can count, but have you ever been on the hunt for a polo that fits well, looks good, and is as soft as your favorite t-shirt? Sure, there are a few options that come close, and may fit two of the three categories we listed, but until a few weeks ago we were not able to find anything that was exactly what we were looking for. Luckily, we were turned on to a company based out of California called johnnie-O. Their 4-Button Polo ($55) meets all three criteria and is quickly working it’s way into our regular rotation for work and play. Well, the bachelor party that inspired “Mountain Week” is officially in full swing, so today marks the end of our first theme week here at Bows & Boats. After a couple of days on the slopes, and a couple of nights checking out the local establishments, the car ride home tomorrow is going to be interesting to say the least. A go to clothing choice for whenever we are roadtripping it is a basic hoodie and a pair of jeans. Honestly, there isn’t much reason to go with anything more dressy. 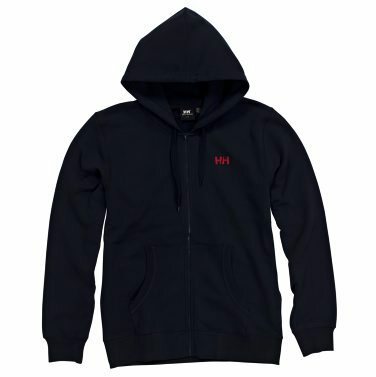 If you are looking for a new hoodie, take a peek at the Full Zip Logo Hoodie ($60) by Helly Hansen. Did you really think we could make it through “Mountain Week” without talking about a solid pair of boots? We have already profiled one pair of Maine Hunting Shoes by L.L. Bean (the waxed canvas version), but just like top-siders, it never hurts to have a couple of pairs on hand. 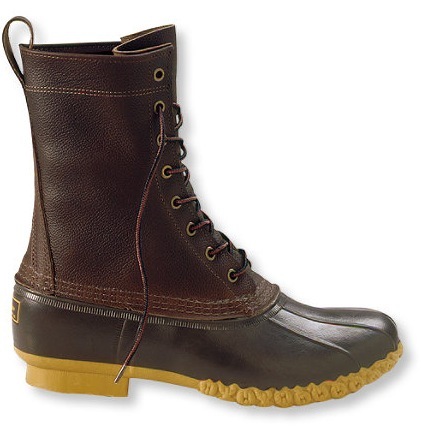 For times when you are sure to see low temperatures and lots of snow or slush, we recommend the Maine Hunting Shoes with Gore-Tex/Thinsulate Liners ($164). When you are packing for a ski/snowboard trip, it is nearly impossible to leave without your skis/snowboard, boots, jacket, etc. But sometimes, the littlest things that get left behind are the ones you really wish you had. 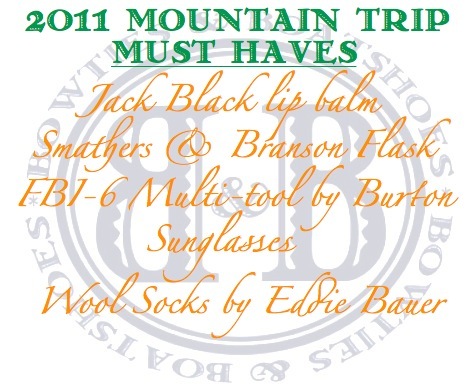 Below are a few must haves that we have managed to forget at least once on a trip to the mountains. What is on your “do not forget” list?